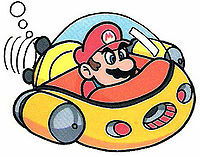 The Marine Pop is a submarine used only in World 2-3 in Super Mario Land. In this machine, Mario can travel through the water while shooting torpedoes to defeat enemies. The machine could also be used to take out the boss of the level, Dragonzamasu. The player can either shoot at him until he is vanquished, or just go under him to flip the switch past him. Tamao is the only known sea creature who cannot be destroyed by the Marine Pop's torpedoes. The Marine Pop could also grow with Mario as he grabbed Super Mushrooms, and also could turn invincible with Stars. Even though it could power up with those, Superball Flowers would not affect it. ↑ Super Mario Land Japanese instruction booklet, page 12. This page was last edited on August 22, 2018, at 18:30.